The iCloud Activation lock screen on your iPhone is happen if your iPhone is lost or stolen. Then the original user will block your device with Find My iPhone tool in the device. Now you need to know the email user and pass code for original user. But this not is possible, we have some tool to resolve your problem, to bypass this icloud activation lock. 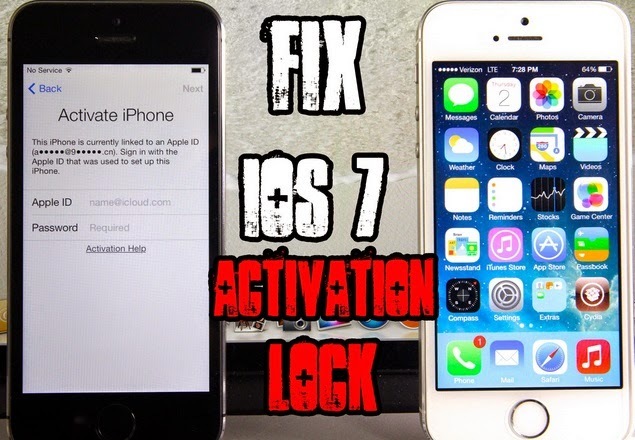 This is the best tool to bypass iOS 7.1 activation lock from your Device permanent. We here will present the best solutions for your problem as to remove your Apple ID activation lock permanent in five steps. First you need to download this software in your PC. Then make the step by step bellow in this part. Unzip the Tool, click two time to start the tool. Conect your iPhone via usb cable with your computer. And put in DFU mode. Then this tool will read your phone. Then is need to click on “Start” button. Here will ask to chouse your Device model. Selekt your iPhone model from the list. And then click “Next”. This Process will take 20-25 min. When process will be complete, your device will reboot auto. This is all, your iCloud Activation is removed now. Now is need to set your new iPhone, when will set will see that not will ask you to add the iCloud ID and Pass code. All will be normally here. NOTE: If you are unable to activate your iDevice with above stated method please go through the link below for alternate proven icloud activation method. I can't download from link provided, no survey list. Can you provide another link please that doesn't require survey? Thanks in advance. Unfortunately i don't have any direct link for download. You can try doulCi server or GadgetWide method otherwise wait for few days, doulCi team is developing and testing new method for all apple iDevices. u can share Tool Support iphone5 for me? I can't get it to work on iPad 2 WiFi. I followed the steps but it just bypasses the iTunes screen and not the one on the iPad. Any ideas why? Why does every direction ignore the question of what to do about device activating in ITunes and not on device? The bypass worked great--thanks! But how do we finish bypassing??? does ANYBODY know?